A notable trend in recent scholarship on the nature of the European Union and its democratic legitimacy focuses on the concept of `legislation and its employment within the European Community's legal system. In this remarkable work of synthesis, Alexander Türk exposes and elucidates the underlying uncertainty as to the meaning of the term, and even its legitimate use, within the Community's legal order. 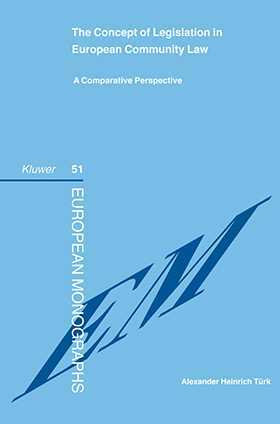 He arrives at a clear evaluation of the extent to which the concept of legislation can be applied in the EC through a comparative analysis of the British, French, and German constitutional systems, and proceeds to reveal and highlight aspects of the concept of legislation derived from this analysis appearing in areas of EC law. the co-decision and assent procedures of the EU institutions as `legislation in form. All those interested in the nature of the EC legal system and the state of its development will find this study richly rewarding. Building rigorously on detailed analysis of EC case law and on prior scholarship, the book shows the way to a new understanding of the relevance of the concept of legislation to the solution of some of the EU's most pressing legal issues. Preface. Abstract. Table of Cases. Introduction. Part One: Member States Definition of Legislative Acts. A. Definition of Legislative Act in the UK. I. The traditional concept of legislative act. II. Challenge to the traditional concept: Government as lawmaker. III. Summary. B. Definition of Legislative Act in French Law. I. Allocation of lawmaking powers under the Third Republic (1871-1940) and Fourth Republic (1946-1958). II. Definition of legislative act in the Fifth Republic. III. Summary. C. Definition of Legislative Act in German Law. I. Historical developments before the 1949 Constitution. II. Definition of legislative act under the basic law of 1949. III. Summary. D. Conclusion. Part Two: Legislative Acts in the EC Legal System. A. The Law-making Structure in the EC Legal System. I. Principle of attributed powers. II. Horizontal allocation. III. Vertical allocation. B. EC Acts as Legislation in Substance. I. Regulations as acts of general application. II. Addressees of an act. III. Criteria for the determination of the nature of the act. IV. Relevance of the concept of Legislation in Substance. C. EC Acts as Legislation in Form. I. Nature of EC competences. II. The role of EC institutions in the law-making process. III. Legislative procedures. IV. Relevance of the concept of Legislation in Form. Conclusion. Bibliography.